YACHT PARTIES IN NY - NY'S HOTTEST – YACHT NIGHT PARTY NYC HIP HOP VS. REGGAE CRUISE! NYC HIP HOP VS. REGGAE BOAT PARTY! 1 DAY - 1 EXCLUSIVE EVENT! MUSIC BY NYC HOTTEST DJS AT SKYPORT MARINA JEWEL YACHT PARTY, NEW YORK!! 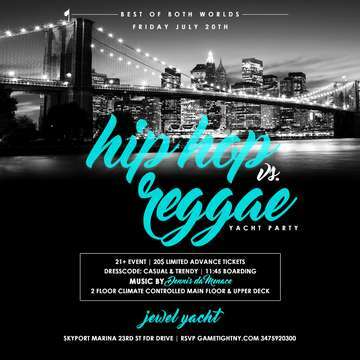 NYC HIP HOP VS. REGGAE BOAT PARTY AT THE JEWEL YACHT AT SKYPORT MARINA!